Rumbly Tummy Pooh: $14.98 + Eligible for Free Shipping, Regularly $34.99! Here's another great Amazon toy deal! 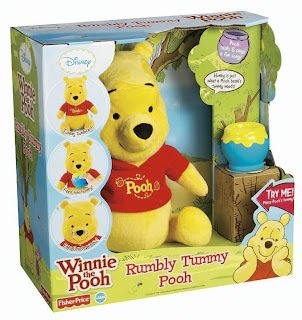 You can get a Rumbly Tummy Pooh for just $14.98 and this will ship for free with a $25 Free Super Saver purchase. I wasn't able to find it on Walmart's site, but it costs $34.99 at Babies R Us so this is a great deal! Honey is just what a bear's tummy needs, especially Disney's Rumbly Tummy Winnie the Pooh from Fisher-Price. When his tummy rumbles, Pooh will politely ask if there might be a bit of honey to spare. Young children learn to care for Pooh as they press the honey pot to his nose to help him happily gobble up his food.